*Note: The puzzle pieces do have very faint gray numbers for 1 to 36 on the front and letters A-Z, plus a repeat of Aa to Jj on the back. Since this is an all white puzzle, it can be a challenge for ages 3+ to put together. 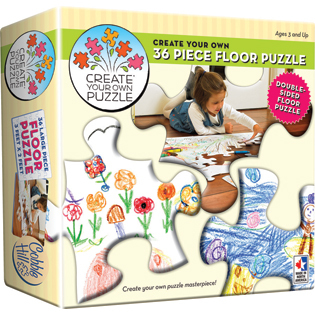 The faint gray numbers help the children to put the puzzle together so that they can create their own floor puzzle image. A legend is also included in the box. See the Instructions tab for the legend. Item # 55101 Weight 2.75 lbs.